Seriously, I *am* working on a NorCal afteraction report. Look for it soon. Meantime, if a picture is worth a thousand words, then moving pictures must be worth, what, two thousand? Gunpowder Gertie made this outstanding video during the festival, and you’re sure to note a lot of familiar faces (including my own handsome mug.) And honestly, my singing was spot on – it’s just the voodoo of YouTube that makes me look out of sync! Less than one week until the Northern California Pirate Festival! 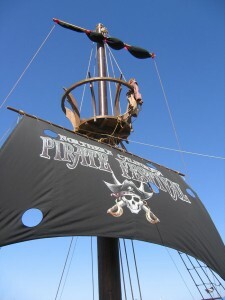 This is its third year, and if the previous two are any indication I can practically guarantee that this will be one of the best events of the year – The Pirates Charles, Skip Henderson, Roving Tars, The Seadogs… loads of great, piratey vendors (no aluminum siding sales, or renfair crap), and even one of the best fair-food selections I’ve ever seen (last year I think they had organic fish tacos or something like that.) And best of all? At Saturday night’s party yours truly will be DJing live! Hope to see loads and loads of you there!